“After nearly twenty years as a top executive for Warner International, I finally decided to realise my biggest ambition of all - to form my own record company recording the kind of music I loved – jazz!” With this statement, Siggi Loch ended his high-flying career as an executive within the international music business, and started again as boss of an independent record label. At the age of fifty it was a major mid-life career change, but with the launch of the ACT label it was the realisation of a dream that had taken him into the music business in the first place. The establishment of ACT took place at a time when the internet was beginning to take-off. In the subsequent decades the international music business would be eroded by CD burning and later illegal downloading, and the market would shrink by half. In contrast to this trend, ACT has become one the most ”most critically acclaimed and internationally respected independents of the current era“ (Jazzwise). More than twenty years later, the project that started in 1992 is a huge success story: “Music for people with open ears and an open mind,” says Siggi Loch and with this guiding principle in place, he set off on his chosen path. The beginning was a truly an adventure, as working with innovative and unconventional music is always a challenge and of course a big financial risk. But it is only when artists and listeners are open to new sounds that ‘magic moments’ are born, of which there are many in the twenty years of ACT history with artists like Nguyên Lê, Esbjörn Svensson, Nils Landgren, Michael Wollny, Viktoria Tolstoy, Lars Danielsson, Wolfgang Haffner and Youn Sun Nah inspiring and changing the music world. Twenty years of magic musical moments across more than 350 releases. Twenty years in which European jazz became a major force in the world of music, with the ACT label playing a major part in this process. And twenty years in which ACT also became one of the most popular European jazz labels, which the people's choice award for Jazz Label Of The Year at the German ECHO Award in 2010, 2011, 2012 and 2013 proves. Jazz is equally at home in Europe as it is the USA, and European jazz is certainly no less rich in musical talent. Yet in order to unearth the depth and breadth of its potential the casual listener might need a navigational aid, and ACT has proved itself to be a reliable compass for audiences who are searching for new jazz, as well as those with an ear for exciting music influenced by European folk music, classical music or other cultures. A good example of this is the very first ACT recording “Jazzpaña” (ACT 9212-2). In 1992 in Cologne’s WDR studio, Siggi Loch and Wolfgang Hirschmann brought together some of the best Spanish flamenco players with jazz greats such as Michael Brecker and Al Di Meola. “Jazzpaña” was arranged by Vince Mendoza, and resulted in a wonderfully multicultural musical statement; flamenco meets jazz, blues from old Europe combined with blue notes from the new world. The album turned out to be a great success – it was nominated for two Grammys and received a German Jazz Award, and a further collaboration between ACT and Vince Mendoza, 2008’s Blauklang, proved yet again to be a winning formula with another Grammy nomination. During the live recordings for “Jazzpaña” Siggi Loch met guitarist Nguyên Lê, who became the first artist signed exclusively to ACT. Raised by Vietnamese parents in Paris, his musical biography developed into an exciting search for identity between Jimi Hendrix, the ethnic melting pot of Paris and traditional Vietnamese music. Lê’s debut album “Million Waves” (ACT 9221-2) was released in 1995 and right up to the present day he has stayed true to the ACT family with a substantial discography of 14 albums. Another critically acclaimed ACT success was the jazz symphony of “Europeana” (ACT 9804-2) which combines the rich tradition of European music with the language of jazz. This 1995 release was written by the English composer and arranger Michael Gibbs and won the annual German Record Critics’ Award. The album featured Joachim Kühn, Jean-François Jenny-Clark, Jon Christensen, Django Bates, Klaus Doldinger, Richard Galliano, Christof Lauer, Albert Mangelsdorff and Markus Stockhausen – the cream of contemporary European improvised music, accompanied by the Hannover NDR Radio Philharmonic Orchestra. ACT’s releases are often an antidote to the idea many people have of jazz – that it is intellectual and inaccessible. Take Bugge Wesseltoft’s “It’s Snowing on My Piano” (ACT 9260-2) for example. This 1998 solo piano album of traditional Christmas songs was the biggest commercial success in ACT's history. One reason for its popularity maybe is its timelessly beautiful melodic structures that work like a soothing balm against the pushy, abrasive kitsch of modern times. Thanks to this rich association with Sweden and its artists, Siggi discovered the talents of Esbjörn Svensson, who was the keyboardist of Nils Landgren’s Funk Unit at the time. With e.s.t. Svensson became one of the most highly regarded young pianists in jazz. The 1999 e.s.t. debut on the ACT label “From Gagarin‘s Point of View” (ACT 9005-2) astonished the jazz world with a vision of jazz piano trio jazz that was fresh and vital. Due to their intense, genre breaking performances the Esbjörn Svensson Trio reached out to audiences beyond the usual jazz constituency. One of the trio’s early successes was to be the first European band to appear on the cover of the American Downbeat magazine, and with the phenomenal rise of e.s.t. Siggi Loch’s vision became reality – “jazz is cool!” Jazz wasn’t necessarily being relegated to a mere footnote in the music world, but was filling big venues, and as if to underline this the concert recording “Live in Hamburg” (ACT 6002-2) became a modern milestone, chosen as the best jazz album of the decade by the London Times in 2009. Although Svensson’s tragic death in 2008 left a huge gap that was almost impossible to fill, his pioneering work in the field of contemporary European jazz continues to live on. In addition to Landgren and Svensson, several other established jazz stars from the north have turned ACT into the most successful label promoting Swedish jazz artists, including Lars Danielsson, Viktoria Tolstoy and Rigmor Gustafsson. 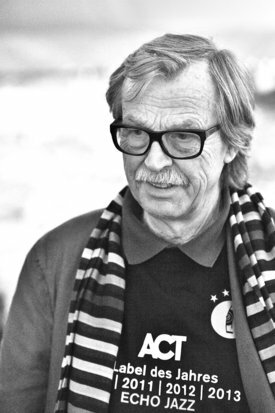 In recognition of Siggi Loch’s far sighted vision in promoting Swedish jazz, Carl XVI Gustaf of Sweden conferred a knighthood (Knight 1st Class of the Order of the Nordstjärneorden) on Siggi Loch for his services to Swedish culture in Germany in 2010. “Jazz made in Germany” has also been very close to Siggi Loch’s heart. In 2005 he heard the young pianist Michael Wollny on a demo tape and was extremely impressed. Wollny’s debut on ACT “Call It [em]” (ACT 9650-2), the trio with Eva Kruse on bass and Eric Schaefer on drums collectively dubbed [em], was the first album released in the ‘Young German Jazz’ series. In addition to [em], Wollny performed in critically acclaimed duo recordings with Heinz Sauer and Joachim Kühn as well as solo projects. The British jazz writer Stuart Nicholson named their latest album “[em] Live at JazzBaltica” (ACT 9668-2) “the best jazz album of the last 25 years”, while The Hamburger Abendblatt called Wollny “the strongest (jazz) personality in Germany since Albert Mangelsdorff”. Other new jazz talents like Julian & Roman Wasserfuhr, Matthias Schriefl, Jan Zehrfeld’s Panzerballett or the latest discoveries Three Fall and Mo’Blow have all found their way into the spotlight thanks to Loch’s pioneering work with the ‘Young German Jazz’ series. Established German jazz musicians have also found their home at ACT: the country’s most sought-after drummer, Wolfgang Haffner, is the most successful German artist on the label. His 2006 album “Shapes” (ACT 9603-2) was another ACT best seller, receiving the German Jazz Award, while his 2008 album “Acoustic Shapes” was called, “a superb example of European jazz at its best,” by the British jazz magazine Jazzwise. With these albums, Haffner joined a distinguished roster of his fellow countrymen on the ACT label like Joachim Kühn, Heinz Sauer, Jens Thomas and Christof Lauer. According to the English broadsheet The Guardian, “ACT is on a mission to introduce the world to Europe's rising new jazz pianists,” and looking back over the last’s twenty years the label has become home to some remarkable jazz piano talent including Joachim Kühn, Esbjörn Svensson, Iiro Rantala and the Grammy nominated Vijay Iyer, as well as younger virtuosos such as Yaron Herman, Gwilym Simcock and Michael Wollny. Very recently the Polish pianist Leszek Możdżer has gained huge acclaim for his homage for the forefather of Polish jazz, Krzysztof Komeda. Shortly after its release, his solo album “Komeda” (ACT 9516-2) went to Number One in the Polish pop (!) charts, leaving world-conquering stars like Sting and Beyoncé far behind. Since ‘The Swedish-German Friendship Concerts‘ in September 2008, a favourite location for live ACT recordings has become the remarkable Schloss Elmau, a unique hotel complex and cultural hideaway in the Bavarian mountains. Schloss Elmau has hosted concerts featuring ACT artists such as Nils Landgren, Michael Wollny, Viktoria Tolstoy and Lars Danielsson that were dedicated to the memory of Esbjörn Svensson, who had died just three months before. These concerts were released on “Magic Moments @ Schloss Elmau” (ACT 9480-2), and inspired a whole series of further recordings at this magical place. With recordings by Gwilym Simcock, Joachim Kühn & Michael Wollny, Danilo Rea & Flavio Boltro, Vladyslav Sendecki and Dieter Ilg, ACT has established the name of Schloss Elmau as a trademark for outstanding chamber jazz. In 2010 Siggi Loch celebrated three milestones; on the 26th of January, MIDEM in Cannes honoured his 50-year career with a special ‘jubilee night’, on the 6th of August he celebrated his 70th birthday and that same year his autobiography was published. His memoirs prove that Loch’s enormous wealth of knowledge and personal experience would not have been enough on their own to deal with sensitive musicians. In order to bring a label like ACT to life and take it forward, one needs a spirit that is burning for music; one that is constantly seeking new opportunities yet at heart remains a genuine fan of the music. With its 20th anniversary in 2012 ACT has finally come of age, secure, confident and willing to back real talent. Korea’s Youn Sun Nah, currently one of the most successful jazz singers in Europe, made her breakthrough on ACT with “Same Girl” (ACT 9024-2). In France she is already a star, and in Germany she was presented with the ECHO Jazz award for Best International Singer in the spring of 2011. Upcoming American jazz star Vijay Iyer saw his future with ACT and was followed by the American Alto Saxophonist of the Year (Downbeat Critics’ Poll), Rudresh Mahanthappa. With the ACT debut “Samdhi” (ACT 9513-2) in the autumn of 2011 he explored the fields of electro-acoustic jazz and Indian music to stirring effect. ACT celebrated it’s 20th anniversary with a series of “ACT Jubilee Nights” with the “ACT Family Band”, an extensive young german jazz club tour and several celebrated “Piano Summits” with three of the best ACT pianists on one stage. These concerts were the impulse for a new, spectacular concert series, that goes on until today: Jazz at Berlin Philharmonic. The concert series, hosted by the Berlin Philharmonic and curated by Siggi Loch is a true success story. After the celebrated and sold out premiere with the pianists Leszek Mozdzer, Iiro Rantala and Michael Wollny it was decided to continue the series at least until 2015 – with each concert under a different topic and exclusive lineups of musicians in a very special setting. Until now two of these memorable concerts were released on CD. Even more than 2012, the year 2013 was the year of Youn Sun Nah. With the release of her third album “Lento” she managed to even surpass the success of it’s predecessor, in France, the whole of Europe and especially in Germany where the album reached Gold status receiving the “German Jazz Award”. The first half of 2014 was mainly influenced by two German musicians – Joachim Kühn and Michael Wollny: With “Weltentraum”, his new trio album Michael Wollny made his final breakthrough: He reached Gold in Germany in only 8 weeks and made it on the cover of the the British “Jazzwise” magazine as the first German artist ever. The second German artist was Joachim Kühn who celebrated his 70 th birthday with a new duo album “Moscow” (ACT 9623-2) and the 2 CD set “Birthday Edition” (ACT 6017-2). Manu Katché one of the world’s most renowned drummers/bandleaders joins the ACT Family of Artists in the summer of 2014: His ACT debut and first live album “Live in concert" (ACT 9577-2) was recorded at the Parisian New Morning including solely Katché's own compositions. It has now been 20 years since ACT head Siggi Loch met Nils Landgren at the "Jazz Baltica Festival" and instantly signed him to his label ACT. Today, 20 years later Nils Landgren has become one of the most successful ACT artists. Their fruitful collaboration was celebrated with an exclusive Jubilee concert on October 11th in Hamburg and his best songs on the sampler "Redhorn Collection" (ACT 6013-2). On November 3rd, 2014 Siggi Loch receives the "Order of Merit on ribbon" of the Federal Republic of Germany for his achievements that served the nation and earlier, in February 2014 the WDR Jazzpreis for his support of jazz from Germany with the "young german jazz" series.